SAME HAT! 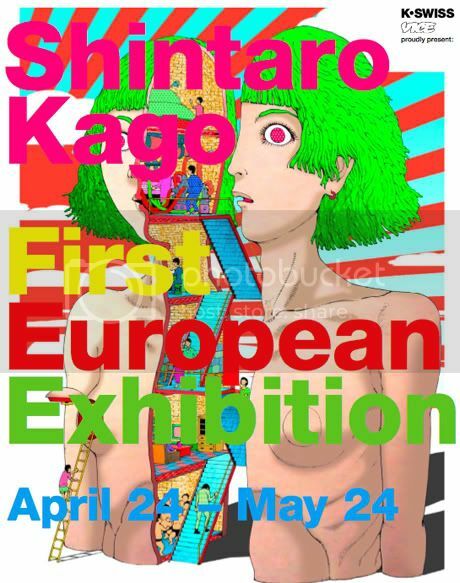 : REMINDER: Kago in Amsterdam today! Just a quick reminder, Shintaro Kago will be appearing in person at K-Space Amsterdam TODAY, for the opening of a month-long exhibition of his work. This will be his first show in Europe, and an opportunity to see his original art, the new mural he created at the gallery, and pick up a t-shirt. Amazingly, the scanlation of 'Abstraction' was part of the exhibition! Actually, I thought it was extremely dissapointing. The scanlation of 'Abstraction' was the only scanlation and the few other pieces of his works (about 6 or 7) were some of his softest pictures (still good but...just not it). The room was very small and overall the exhibition just did little to his credit... I hope there will be a real, good exhibition of his work coming to Europe soon. Then I would really pay to view his works. After all, this was just a free exhibition... I suppose I shouldn't rant too much. Maybe I just wanted to see more. @anonymous1: Holy crap, that's really strange! But cool-- Anonymous K will be pleased. @anonymous2: Huh, that's quite a bummer to hear. I didn't have any sense of the size or scope, but naturally hoped it would be large and really out there. I'm interested in seeing pics, just to see the size and scope of what was presented... large poster-size reproductions? Manga-sized sheets of paper on a wall? etc. It would be awesome to see someone like Giant Robot do a bigger exhibit of mixed media stuff by him in the US sometime. The real question though: Did you get to see Mr. Kago in person?! It is small, but I think the whole thing is quite wonderful. There is a good selection of his art (the Vice cover and similar prints; works mostly displayed before in Vanilla Gallery in Tokyo and used as the cover art for manga collections) and even some original pencil art. Everything is for sale, by the way, including the originals! Kago also made about five small crayon 'murals'. He came out to talk to and pose for fans, dressed in a robe. Thanks for the comment! I just posted pics that we received from a cool dude named Dan and included your description. It seems like a small show, but in the pics I saw a few really interesting pieces. And dude, for sale?? Whoa. How much did the original manga pages or the Vice Cover-esque color pieces run?